Not so long ago, before there were smartphones and GPS devices, maps and compasses used to be prime necessities in any navigational scenario. Compasses, in a way, helped shape the human civilization, helping us navigate seas and brave new territories across the globe. So it is no surprise that they are still being used today. The only difference is, there are no magnetized needles involved. 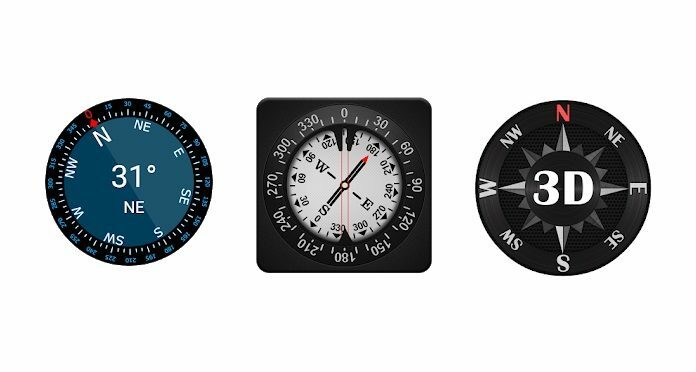 In this article we’ll be looking into some of the best compass apps for Android devices. Sure, it could be fun navigating with a traditional compass. But since everyone owns a smartphone these days, carrying an additional physical device could be seen as a bit redundant. Compasses can be particularly helpful if you’re ever lost in the outdoors, while hiking or backpacking. It can help you get a general sense of the direction you should be headed, and that could mean the world in some extreme life or death situations. Now there are clear advantages to using a Compass app over a physical one. The most obvious advantage is of course how convenient it is to get a compass app. If you own a smartphone, simply download an app and you’re ready. Most compass apps are absolutely free, or cost very little. Compared to high end physical compasses that could cost comparatively more. Since mobile phone screens are lit, compass apps can be easily used in the dark. This is a huge advantage over traditional compasses. Most compass apps come with free tutorials that can be accessed within the app. So there’s that a huge advantage in the learning curve if you’re a beginner. Compass apps come in all designs and complexities. 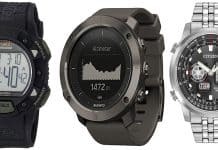 There are simple minimalist apps and those that come with a range of other features such as an altimeter, a barometer, GPS etc. So yeah, compass apps are pretty great! But all that said, we will admit that there are still some disadvantages to relying on a compass app over a physical compass. So let’s just get that over with before moving on to the reviews. Most compass apps will not be quite as accurate as a traditional compass. Compass apps rely on your phone to work. So if your phone runs out of battery, you will have no compass. Physical compasses work great with topographic and trail maps. Compass apps, not so much. But compass apps are still pretty great and it doesn’t hurt to have one on your phone. We will now list some of the best (in no particular order) compass apps for Android available right now. Compass 360 Pro is a simple compass application. But if need be, it can also become something so much more powerful. Some compass apps trade off ease of use for added features, while others trade off complex features for simplicity. 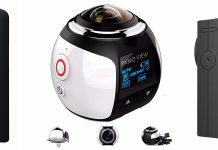 Compass 360 Pro stands out in the sense that it is an app that it perfectly combines both these aspects. The interface has a clean, classic look. 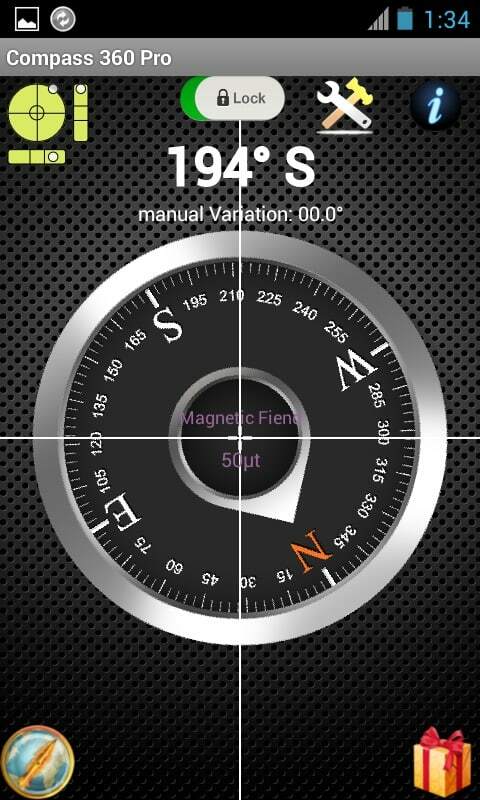 The best thing about Compass 360 Pro is its ability to show the bearings in either true north or magnetic north. 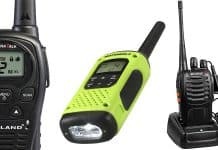 This means that it can be used both for general navigation and for navigating through a topographic map. Unlike traditional compasses that only work great at one of the two hemispheres of earth, Compass 360 Pro works great everywhere! Its bearings are easy to understand for a beginner but are also powerful enough to help those with some serious navigational knowledge. Can be used exactly like a traditional compass. Can actually be a great teaching tool. Don’t let the name fool you. This is a free application. The Ads can be a bit annoying. Still not as many features as in some of the other apps reviewed here. Uses up a lot of the device’s power. 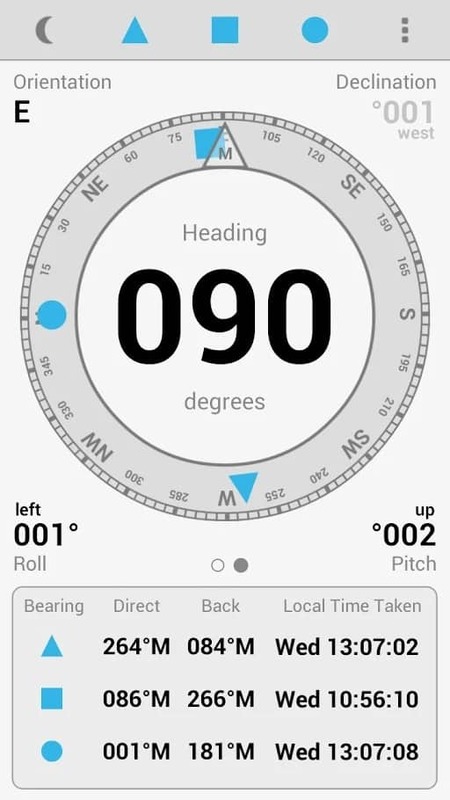 Digital field compass is possibly one of the most minimalist compass apps in this list. But don’t let its simple interface fool you. It is incredibly powerful and accurate at what it does. While there are other great compass apps, some of them tend to over complicate things with a lot of other features. And if a simple navigational compass is what you need, there’s no point over complicating things. And digital field compass succeeds at doing just that. Its minimalist interface means that it uses a lot less battery power compared to other compass apps. You can manually configure the declination with Digital Field Compass and the app informs you about any possible magnetic interference. And another great thing about it is that it can also serve as a great maritime compass with settings for pitch and roll! All in all, this is a great compass app to have on your phone. Has an intuitive interface that is incredibly easy to use. Is one of the more accurate compass apps. Does an amazing job at orienteering. Doesn’t use up a lot of battery power. Has a great nighttime mode. Is a free application. You will get added features in the paid version. A prior knowledge of navigation could be necessary. 3D Compass Plus is one of the more fun compass apps on this list. The best thing about this app is perhaps its augmented reality view. 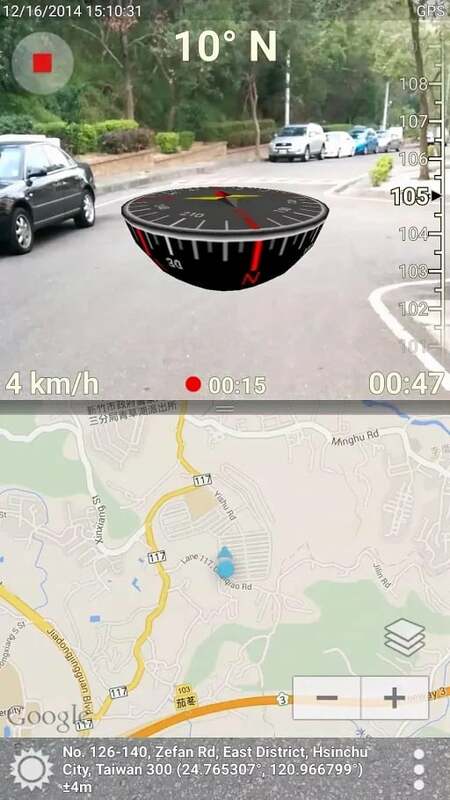 This mode accesses the phone’s camera to show you the real world on the screen along with a 3D compass, the map, the address, your speed and your coordinates. To get the bearing towards an object, all you have to do is to point the camera towards it. You can also record a video of your course and export it to share with your friends so they can follow you. This app can also be a great tool for anyone interested in orienteering. Another great use of this tool is to learn navigation. 3D Compass Plus can help beginners learn compass navigation by teaching them the relationship between bearings and travel. All you need to get started is set it up and start walking. Can serve as a great educational tool to learn navigation. Has an amazing augmented reality mode. Has many more features than just a compass. It is an overall fun app to use. As you might have figured out by now, this is nothing like a traditional compass. The interface can feel a bit distracting. 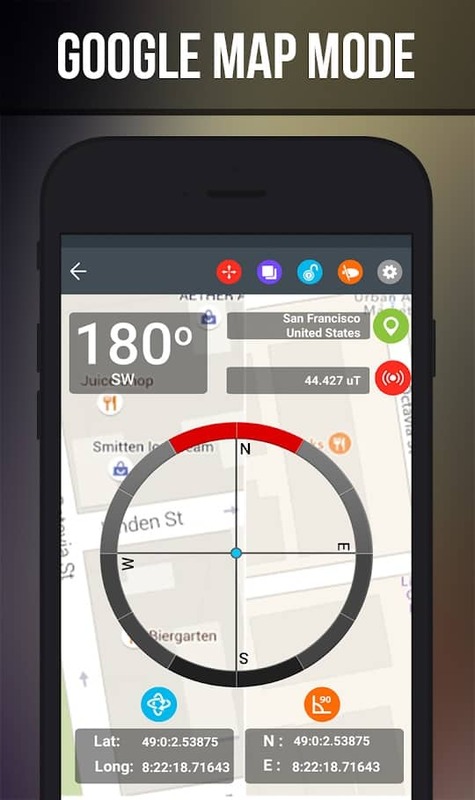 Real Compass Navigation: GPS Correct Direction is a versatile compass app for android. More than anything else, it is a navigational tool for drivers, helping them get to where they want to be. The app converts your smartphone into a smart marine-style compass. There are countless ways you could calibrate this app based on your unique scenario. As we’ve mentioned above, GPS navigation is one of the distinguishing features of this app. So for instance, if your GPS navigation is being affected by a GPS magnetic field, you could calibrate the app to account for that. User can choose between true heading (based on true north, useful when navigating through maps) and magnetic heading (based on magnetic north, useful for general navigation. Shows sunrise, sunset, moonrise and moonset times. Is a free application. Also it is ad-free. Can be a little complicated for some users. Uses a little too much battery. So that concludes this list of the best compass apps for android. We hope you found this useful.